I've written before about what I never leave home without. That list has changed a bit in the past year and a half (for instance, it now includes an iPhone and an iPad), but has stayed generally the same. I am a fan of minimalism, but not in the sense that I cut things out of my life just to be minimalist, but rather that I have, carry, and use only what I need and this often means carrying something that serves more than one purpose, which brings me to today's edition of "I can't wait to get one of these." 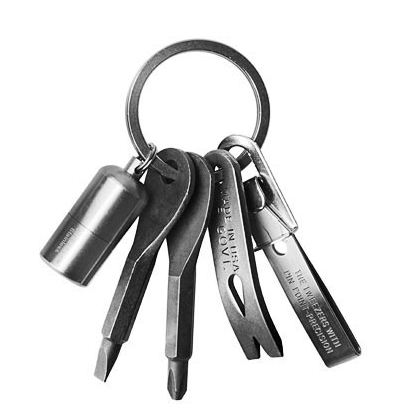 EDC Kit: At the core of it, EDC is personally defined. You find and carry the things relevant to your own life. The idea is to keep it streamlined with an eye towards self-reliance — you want items that do the most while taking up as little pocket space as possible. This little gem sports a pry bar (which "the U.S. Military found handy enough to specially request for outfitting their soldiers"), a 1-inch capsule lighter, two screwdriver keys (flat head and Phillips head), and precision tweezers. Head on over to Kaufman Mercantile's site and read the full description. I'll be picking up one of these in the next few days myself. Also, signing up for their email list scores you a $7 site coupon. NB: This is not a paid advertisement and I am not a Kaufman Mercantile affiliate (though now I think I would love to be one). I just try to share products that I think are worth spending money on myself and that you may be too.